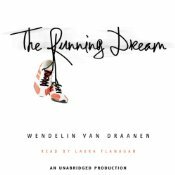 The Running Dream by Wendelin Van Draanen, read by Laura Flanagan. Grades 7 and up. Listening Library, 2011. 7 hours and 3 minutes. Reviewed from purchased copy. I don't do a lot of rereading. Honestly, I don't make the time for it when I can't read nearly as many new books as I'd like to. Audiobooks are a nice compromise. Listening to an audiobook of a title I've liked is a way to "reread" and also experience the book in a new way. Not all books stand up to a reread, even in audio format, but I'm happy to say that The Running Dream definitely stands up! With this reread, I was less sensitive to the fact that everything turned out unrealistically awesome and more sensitive to Jessica's struggles and her determination not only to succeed but to make life better for another person. Possibly this is because I already knew what was going to happen, but I also have to give credit to the audio format. The first-person narration lends itself to audio quite nicely and narrator Laura Flanagan brings Jessica to life, reading the poignant moments of Jessica's struggle with true emotion. Flanagan does a particularly nice job with the high emotions at the beginning of the book as Jessica finds out what happened with the accident and starts to deal with her new reality. Laura Flanagan's reading is no-frills, although it is partially voiced. Her men's voices sounded a little goofy to me, especially Jessica's prosthetics guy. But she makes up for it with Rosa's voice. In the book, Rosa (who has cerebral palsy) is described as being difficult to understand and Flanagan pulls off her speech impediment while still getting the words across. She also reads Rosa with a warmth that befits her character. Flanagan's reading reminded me of Sara Zarr's reading of her own works, which I have really enjoyed. They both come across with a sense of authenticity about their characters and a frankness that I find very appealing. I'd recommend this audiobook to anyone who's liked Sara Zarr's Story of a Girl (read by Sara Zarr) or If I Stay by Gayle Forman, read by Kirsten Potter. Check out more audiobook reviews of The Running Dream at Everyday Reading and Reading with my Ears. * Hey, I'm an Audible affiliate, so if you purchase stuff after clicking the links on this site, I may get a small commission!